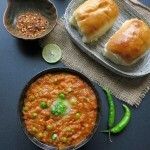 Mumbai Pav bhaji is the most popular street food of Maharashtra but now its loved by each and every one all over India.Its quite a healthy dish as its a medley of so many vegetables. 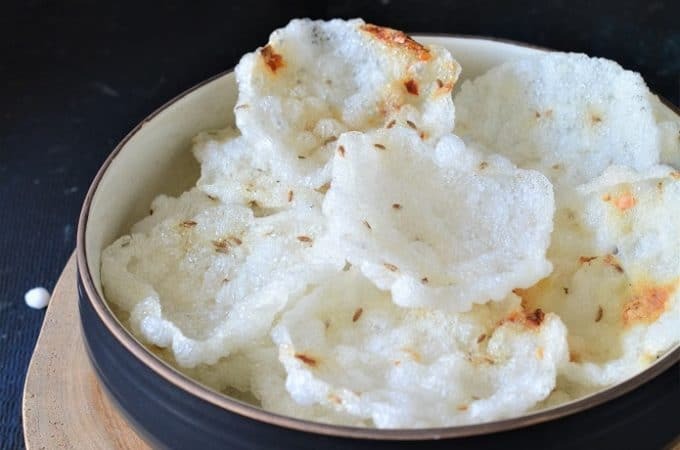 Though the street vendors makes it with a generous amount of butter to enhance its taste but if you make it at home then you can surely make it with less amount of oil and butter. 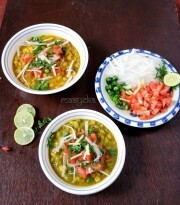 Though the main vegetables which are must to make the bhaji are potato,tomato,peas and capsicum, rest all vegetables are used to give thickness and body to the bhaji,you can use according to your choice or availability from -cauliflower,cabbage,carrot ,beans,pumpkin,bottle gourd,peeled brinjal ,slice of beetroot etc. 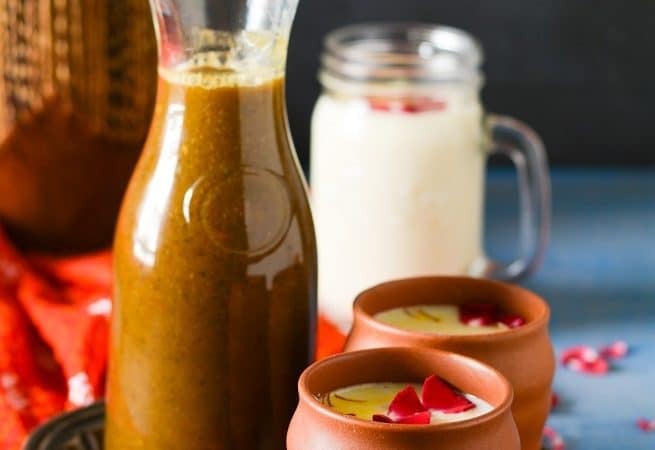 This street food is very good for children if you make it at home.You can also add soaked,boiled and crushed soya granules, boiled dried peas or chickpeas in it to give smoothness and thickness and to add nutrition. 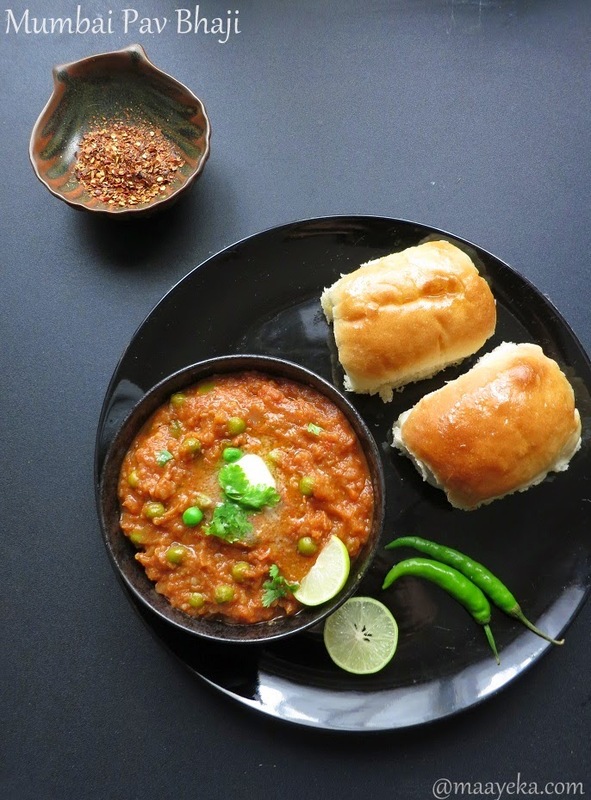 The star ingredient of pav bhaji is obviously the addition of Pav bhaji masala so don’t skip it and try to use a good brand as it makes a lot of difference in the taste. 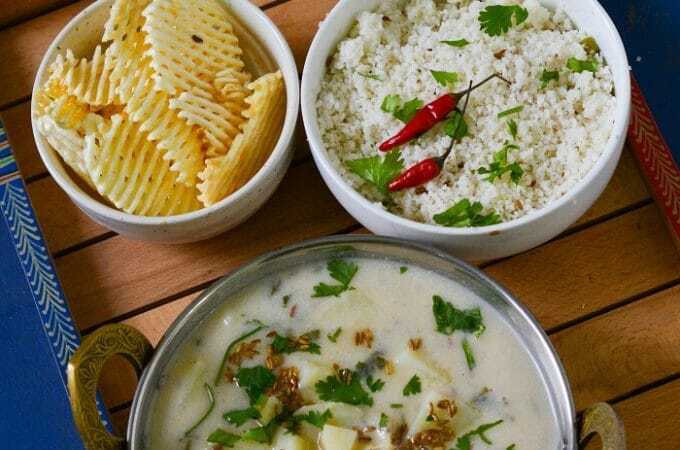 Peel potato and bottle gourd and chop in medium size pieces. Scrape and grate carrot and keep aside. Chop capsicum, purple cabbage and cauliflower in small pieces. In a pressure cooker add chopped potato, bottle gourd, grated carrot, cabbage, cauliflower,1.5 cups of water and pressure cook on medium heat for 4 whistles. Heat oil in a pan and then add butter ,when it become warm then add chopped capsicum and saute on medium heat. When capsicum change its colour then add grated ginger and tomato puree. Cook on medium heat, keep it covered with a plate to avoid it spluttering all over. When it starts to thicken then add 1 tbsp of butter, boiled green peas ,all the dry spices, and keep stirring it till oil start leaving from the sides. Now add the mashed vegetables and mix it well. Cover the pan and let it simmer on low heat for 10 minutes. 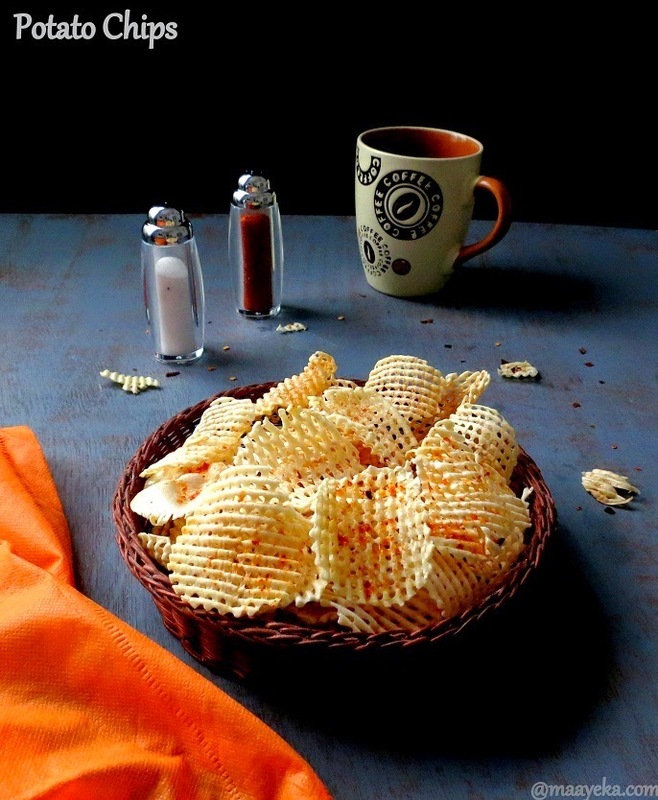 Serve hot with roasted buttered pav. Slit the pav from the center. 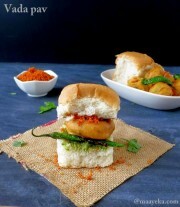 Heat some butter on the tawa/griddle and sprinkle some chili powder and a pinch of pav bhaji masala and immediately keep the slit pav over it. Press the pav slightly and cook for few seconds from both the sides till they turn crisp and hot. 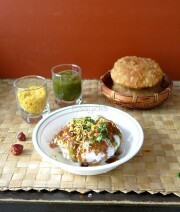 Remove from the tawa and apply some butter on top of the pav. 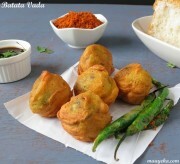 Serve bhaji with a dallop of butter,hot roasted pav, some deep fried green chilies and a wedge of lemon. 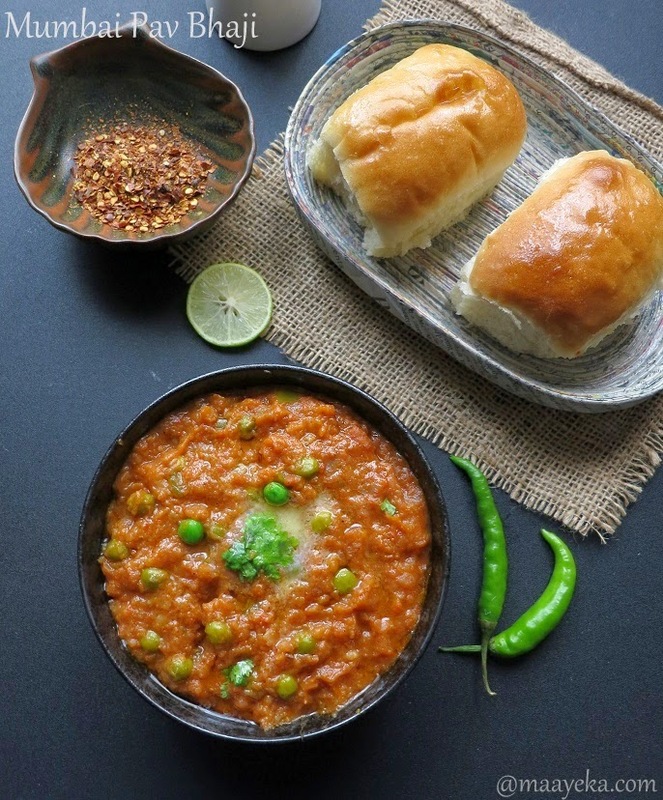 Though the list of vegetables is quite long to use in pav bhaji but the main ingredients are - capsicum, potato,peas, tomatoes and pav bhaji masala, all the mix vegetables are added to give texture and volume to the bhaji . 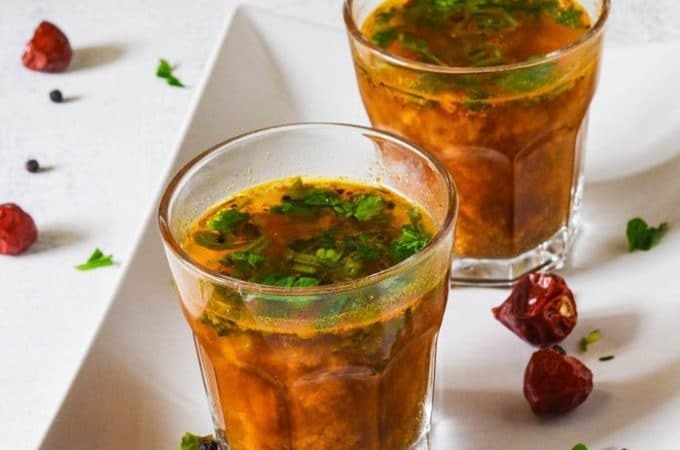 You can also add some soaked and boiled dried green peas or chick peas/chholey at step -5 to give thickness to the bhaji ,many restaurants and street vendors use it. 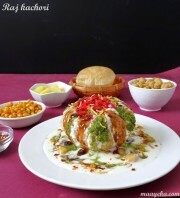 You can also add french beans, peeled brinjal, a slice of beetroot and yellow pumpkin in the bhaji. 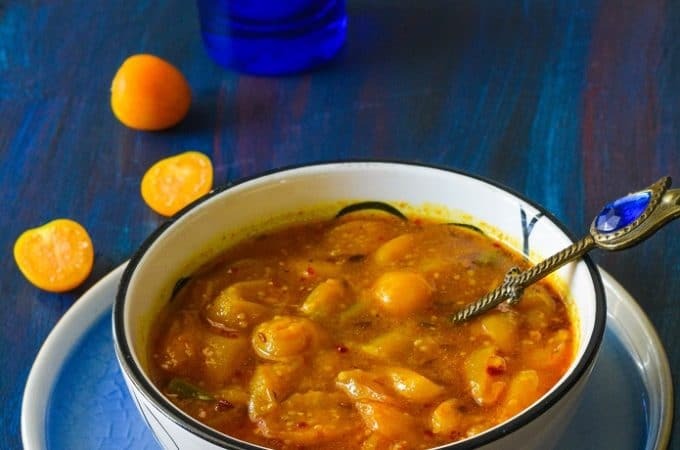 The ratio of potato,tomato and all the mix vegetables are approximately 1:1:1 ,but as I don't want to add too much potatoes so I have used some bottle gourd in it ,you can also use yellow pumpkin or squash instead, their will be no change in the taste and will be more nutritious. I have used purple cabbage instead of green cabbage because its more nutritious then green cabbage and most of the children avoid eating it due to its colour so its a good idea to hide it in pav bhaji and it also give a nice dark colour to the bhaji ,so I prefer it but you can easily use green cabbage instead or can use only cauliflower. 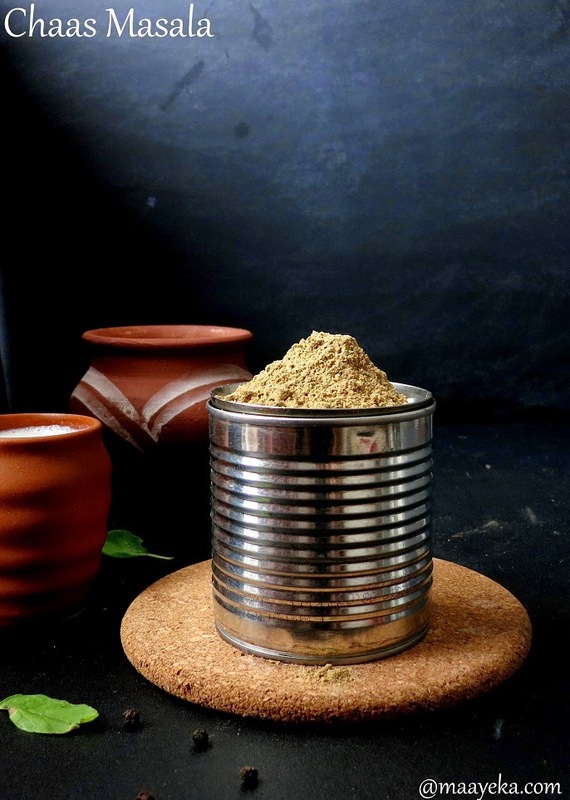 The quality of pav bhaji masala is also very important so either use home made pav bhaji masala or choose a good brand of ready made masala .I have used -Badshah pav bhaji masala.but don't skip adding this masala. 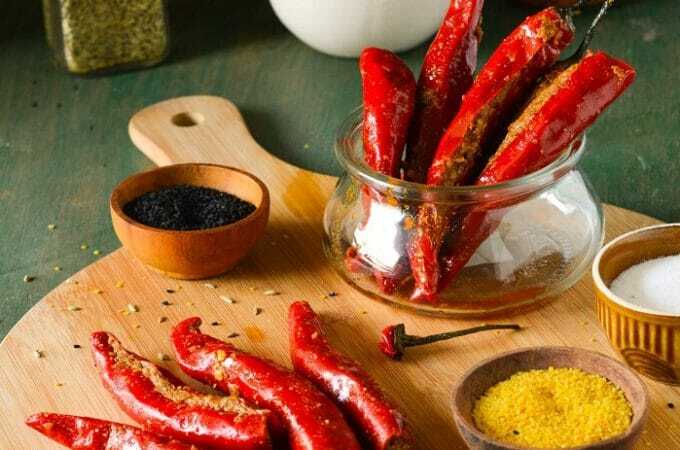 Kashmiri red chili powder is used to give a nice red colour to the bhaji but if it is not available then can use regular chili powder but do reduce the quantity according to its heat. 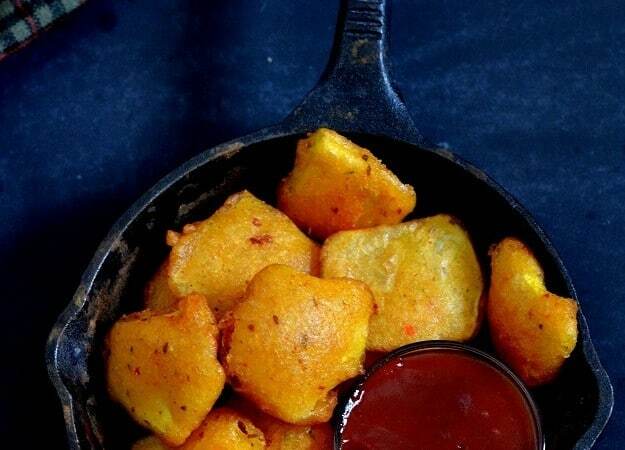 To make it more healthier for your kids you can also add soaked ,boiled and coarsely ground soya nuggets into it. Quick Version- - Many times I just reverse the method -First I make the tomato masala in the pressure cooker then add all the chopped vegetables and water in the pressure cooker ,pressure cook for 4 whistles,mash the bhaji ,add lemon juice and coriander and serve.I really prefer it this way! 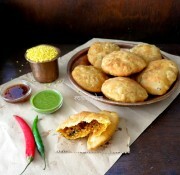 Perfect recipe.. Everyone in family loved it…made it for my friends too.. Now it’s a favourite of everyone I know!